The Worldwide Dive and Sail Fleet (WWDAS) encompasses the Siren Fleet, Master Liveaboards, blue o two, The Junk & The Phinisi. 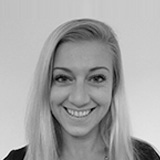 Each vessel offers an exceptional diving experience in diverse parts of the globe. WWDAS was founded in 2004. All boats are well maintained and focused on bringing you the best dive experiences. 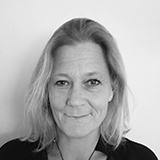 Onboard cuisine is of a high standard, cabins are comfortable, and safety records are good. 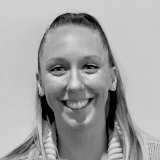 The experienced, professional, and passionate members of the crew will do their best to ensure that you have a fabulous vacation to remember. The WWDAS fIeet offers diving in Asia’s Thailand, the Philippines, and Indonesia, Fiji, Micronesia, and French Polynesia. The Maldives and Egypt’s Red Sea are other sought-after destinations, and you can also book trips to the splendid Bahamas and the spectacular Galapagos. 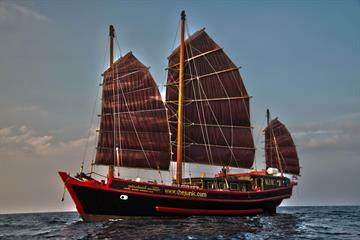 The Junk offers an intimate stay and top-class diving experience around some of Thailand’s most diverse waters. Marvel at the marine life around the Similan and Surin Islands, and admire the creatures that live close to Phuket and Koh Phi Phi. The vessel prides itself on its delicious cuisine. Equipment rentals and courses are available. Expert dive guides travel onboard, with the number of staff usually higher than the number of passengers. You are dropped off at dive sites by dinghy, and then collected again when you resurface. The boat can accommodate up to 12 passengers per small ship cruise, with just en-suite and air-conditioned six cabins on the boat. The beautifully renovated traditional junk has an indoor lounge with entertainment facilities and a shaded sun deck. 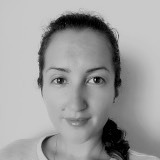 She’s an ideal choice for anyone wanting a high-class Thai diving holiday with a blend of the traditional and modern. 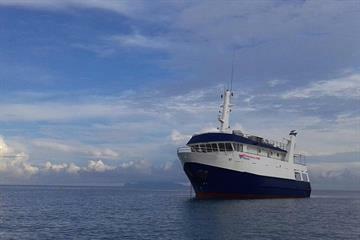 Formerly known as Taka liveaboard the Solomons PNG Master is one of the latest additions to the WWDAS fleet. 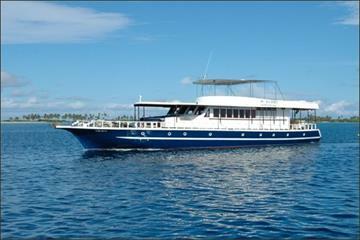 A custom built 30m yacht taking divers to the very best that the Solomon Islands has to offer. With a choice of Premium, Deluxe and Standard cabins, all en-suite, Solomons PNG Master is one of the very few liveaboards offering trips around this area. A spacious dive deck has toilets, freshwater showers & rinse bins for equipment and camera gear, as well as ample storage space. Divers with cameras are well catered for with a dedicated camera area. The Indo Siren as custom built for diving adventures, and features a large dive deck with big rinse buckets and lockers, and indoor and outdoor camera workstations with plenty of charging points. Adapters are available. Dine al fresco and enjoy the sites above water as well as in it. 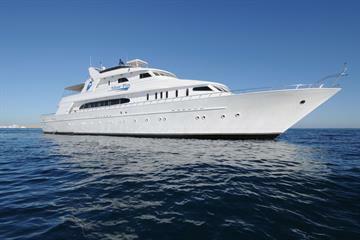 Her eight cabins can accommodate up to 16 guests. Each is en-suite and air-conditioned. 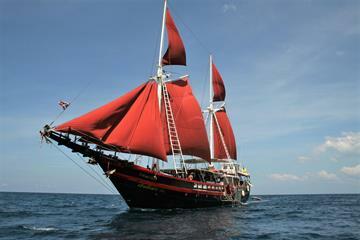 She sails around the bio-diverse Raja Ampat, the stunning Komodo Island, and the scenic Banda Sea. 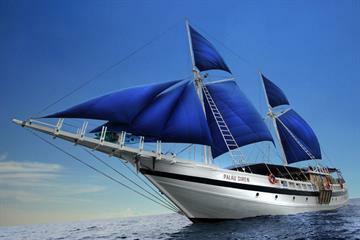 Another purpose-built dive vessel, the exquisite Palau Siren sails around splendid Micronesia, including sites around the German Channel, Ulong Channel, and Blue Corner. 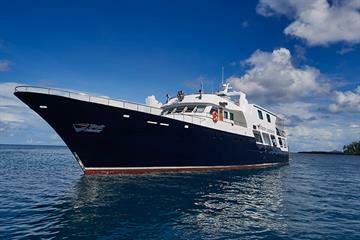 She has just 16 guests on board per trip, accommodated in eight well-appointed cabins. Built to the same specifications as the Indo Siren, her large dive deck, excellent camera stations, and outdoor dining area, are sure to please. Truk Master is another top choice for diving adventures in Micronesia. 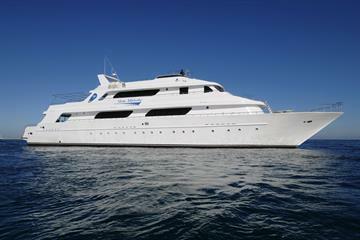 She can also sleep 16 guests in eight air-conditioned en-suite cabins. There’s an indoor lounge/bar with a TV, a sundeck, and an outdoor observation area. The spacious dive deck has storage and a camera table. Access is provided by a large platform at the back of the boat. There is a camera station with plenty of charging points. Exploring Malapascua, Tubbataha, and the Visayas in the Philippines, the Philippine Siren was constructed with diving in mind. 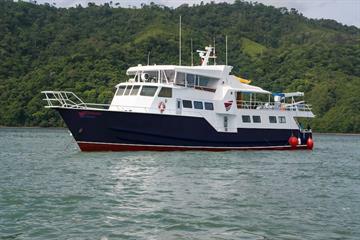 She has a large and well-equipped dive deck and both outdoor and indoor camera workstations with ample charging points. You can dine outside before retreating to your comfortable en-suite cabin. All eight cabins are air-conditioned for complete comfort. 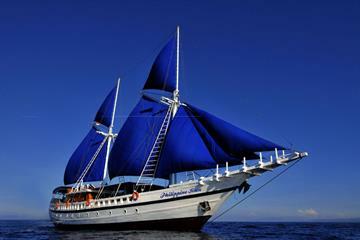 The Philippine Siren sails with a maximum of 16 guests per intimate adventure. 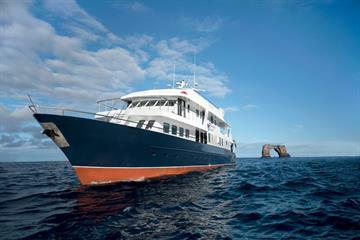 Discover the plethora of fascinating marine life in the Galapagos onboard the Galapagos Master. 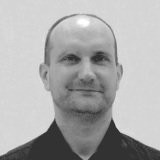 Sites visited include Darwin Island, Wolf Island, Punta Vicente, and Cabo Douglas. Eight cabins accommodated 16 guests. Each cabin has air conditioning and a private bathroom. There's an indoor lounge and dining area in addition to a sun deck and observation area. The lower-level dive deck has personal gearing up stations, camera rinse bins, and plenty of storage space. There are also two bathrooms for you to rinse off before going to your room. 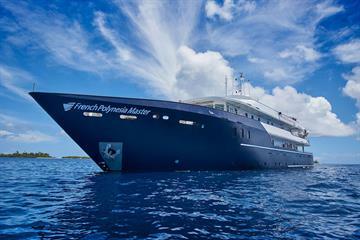 The French Polynesia Master has 13 comfortable cabins with private bathrooms and A/c. She can sleep up to 25 guests. 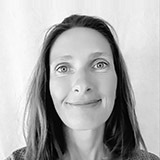 She has three large tenders for access to excellent diving and snorkeling sites around Polynesia’s Rangiroa and Fakarava. The dive deck has personal set-up areas, storage facilities, and a camera table. Unwind on the sun terrace, complete with two Jacuzzis, relax in the shaded outdoor area, or mingle in the indoor lounge. Explore the best of the Maldives onboard the Maldives Master/Blue Voyager, or MV Sea Spirit, visiting exciting destinations like the Far South Atolls, the Ari Atoll, the Rasdhoo Atoll, the Vaavu Atoll, Laamu, and Huvadhoo. 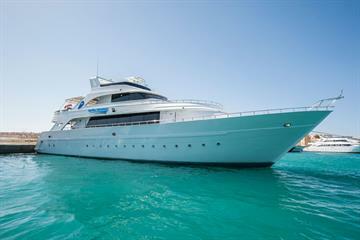 Part of the Master Liveaboards arm, the Maldives Master can accommodate up to 26 guests in 13 comfortable en-suite cabins. 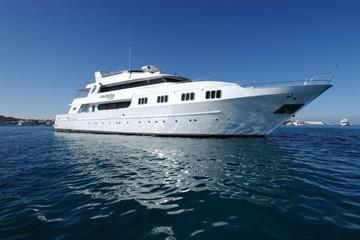 There’s plenty of space onboard to relax, and the boat has a large tender and the area’s biggest diving dhoni. She has a bar and lounge, outdoor dining area, three sun decks, a shaded outdoor relaxation area, and a Jacuzzi. Dive in captivating spots such as Cat Island, Tiger Beach, and the Exuma Cays as you sail around the spectacular Bahamas with the Bahamas Master. She has eight comfortable cabins, each en-suite, for just 16 divers per trip. Each cabin has large windows for great views. There’s a sundeck and well as covered relaxation areas. Everyone has their own personal space for getting ready on the dive deck, and there’s plenty of storage space. There are also rinse bins and a camera table. Egypt’s Red Sea is a fascinating area with plenty of aquatic life and interesting underwater features. Several vessels offer cruises in the area, with sites including Brothers, Daedalus & Elphinstone, St. John’s, Zabargad, and Rocky. Board the Red Sea Master/Blue Horizon, Blue Fin, or Blue Melody for a fantastic diving adventure. The award-winning sleek and modern Red Sea Master/Blue Horizon was updated in 2016 and can sleep up to 26 guests in 13 cabins. A sleek and modern vessel, she has a sun deck and a separate shaded relaxation area, a sky lounge, and a spacious dining room. Of course, she’s also well set up for great diving. 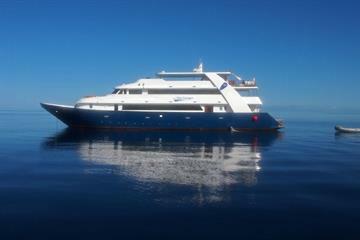 Although it’s the same boat the Red Sea Master name is marketed by the Master liveaboards side whilst Blue Horizon is marketed by the Blue O Two side. The stylish Blue Fin was updated in 2016. She has 12 cabins, including three king-sized suites, that can sleep up to 24 guests. Each cabin is en-suite with air-conditioning, a mini fridge, and entertainment systems. 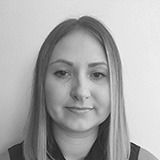 Communal areas include an indoor lounge, a sundeck, and a shaded relaxation area. There’s a TV in the lounge. Charging stations, a Nitrox membrane, and a booster pump are among the dive equipment and facilities. 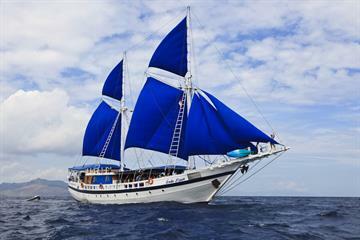 The Blue Melody is another award-winning ship from the Blue o Two arm. Onboard facilities include a sky lounge with an entertainment system, a large dining room, a sundeck, and a large dive deck. She can accommodate 26 passengers per trip. All 13 cabins have air conditioning, a private bathroom, and entertainment facilities. Dive equipment is available to rent. Excellent dive facilities, experienced crew, comfortable cabins and communal areas, and high safety standards are just a few reasons to choose a trip with the WWDAS fleet for your next liveaboard diving adventure. Of course, you’ll also get to visit some of the best dive sites in the world!